Just like lot others, even I had an inhibition that making pickle is a very cumbersome process and it does not turn out perfect for all and always. Now its the mango season and I just cant afford to miss the chance. So this time I took charge and learnt to make this pickle all by myself. :) If a fresher like me can do, why not you??? Wash and dry the raw mangoes on a cloth. Make slits in them in both the directions like shown in the below picture. The slit should go just about 3/4 of the mango, so that the top portion is still stuck together. Dry roast fenugreek and asafoetida separately for just few mins and then grind it into a fine powder. Now mix the salt, chilly powder, asafoetida, fenugreek powder and turmeric powder in a bowl and keep it aside. Now take the oil in a heavy bottomed pan and once it is hot, season with mustard. After it crackles, simmer the stove fully and add mangoes and the mixed masala powder to it. Stir quickly until all the mangoes get mixed with masala. Once done immediately transfer it to a different vessel. Keep the pickle in the same vessel for 5 days. Mix the pickle from bottom up, once everyday. Initially it will look dry but after 5 days the oil will ooze out and look shiny. After 5 days, dilute sodium benzoate in 2 tsp of water and add it to the pickle and mix really well. This is a preservative that is used to keep the pickle from getting spoilt and this also helps in maintaining the crispness of the mango for a long time. Note: Once the pickle is transferred to the bottles, see to that there is a layer of oil on top. This will keep the pickle from getting spoilt. Curd rice with mango pickle is no doubt one of the best foods. :-) This mango pickle looks delectable. slurrrrrrrrrrrrrp! I am just drooling.Why don't I take the entire bowl of pickle to myself and have a nice go at it. I accept to what u say nothing is so best as curd rice and mango pickle.. nithi my mouth just waters seeing the pickle.. We miss all this here. 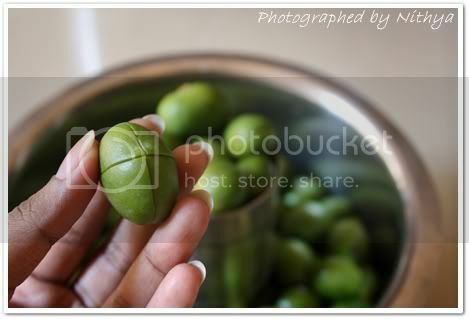 I can feel the aroma of mango seeing the picture itself.. Yummy pickle mmmmmmm!!!!! and also check my straw berry jam.. The pickles look divine! I wish I could find some small mangoes to try this recipe..I like this combo very much as well. 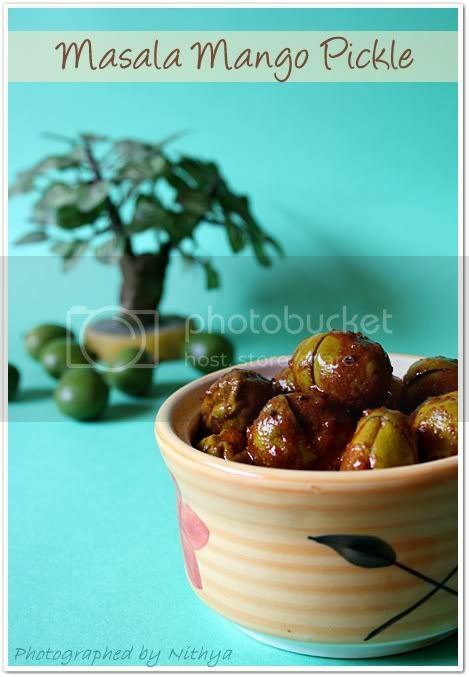 Wow beautiful clicks and wonderful pickle.I too make a similar pickle but use of sodium benzonate is new to me. Agree with Pavi. I wish I can get some of these baby mangas here to make oorga! Looks delicious! Wow!!! so yummm....just love it. Oh my god!! Beautiful pics as usual. I love the step by step pictures. waiting for the mavadu recipe. though this year the mavadu has not come in a big way, still we may get at pazhamudir solai outlets. Such tempting pictures and you have lovely nails and hands! Mango pickle is a favourite here. That's a drool worthy pickle!!! And yeah you are right curd rice with mango pickle combination is awesome. Brilliant photography!! 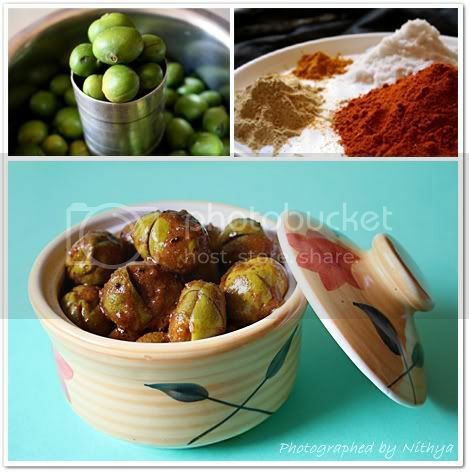 Great recipe too..Am drooling.. Pickles are my favorite. Thanks for stopping by our space. You have lots of very interesting recipes here with amazing pictures. 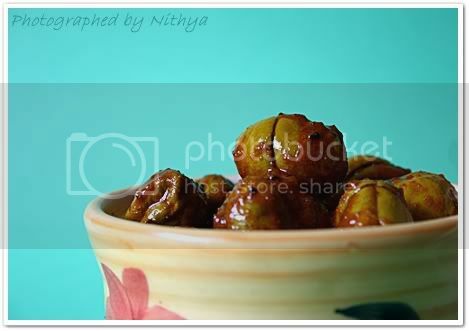 Glad to follow you..
Drooling over the pictures da..
Wow, Nithya, I am drooling over the pics, I love the pickle with baby mangoes. Absolutely yumm. 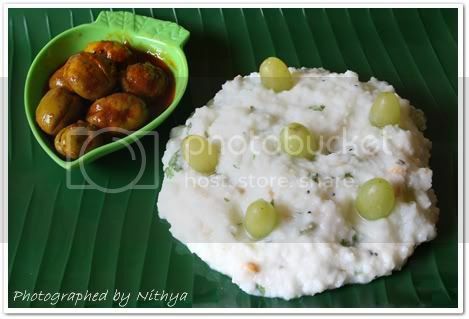 In total agreement with u abt the combination of curd rice and mango pickles. Have never prepared vadu mango like this, interesting,sure to try. wow!! perfect for this seasons..and delicious! oh wow,mango season started there? 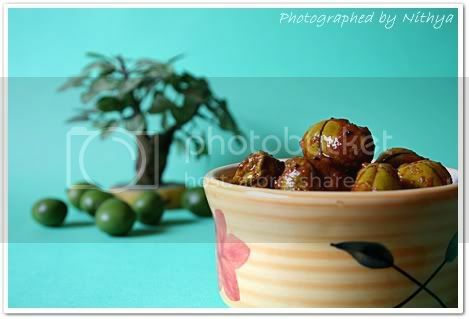 lovely and yummy pickle.cute presentation. mango pickle looks really good. I miss that small mango. thanks for stopping in my blog. Would love this with curd rice... Please visit my blog for a small surprise!! Intha Manga Oorugai mattum iruntha nan life time full a thayir sadam mattum sapdrathuku ready!! Your blog is a huge source of inspiration for me. I am new at blogging. I love to cook and enjoy to learn more about food and cultures. Your blog is just that. Lovely pickle recipe,thanks for sharing! Love to the mangoes....its lip smacking....I love to have it with my curd rice..
thanks for recipe - looks very good - I would not want to use the sodium benzoate - concerned about the health effects - have you done pickle without it? Ma'm, sorry, but with 1 Tsp of Sodium Benzoate in the pickel, you are putting your liver and kidneys to risk. Please try and post the recepies of non-preservative based pickels instead.